Uh oh. Start worrying, Nigerians. So, do you start Jozy after missing so much time or let him come on as a sub? I'm late, but I made it! The French really aren't looking that convincing today, are they? France will finish with 10 men. Lately, most of the goals seems to be coming from the 2nd half. Let's look out! 63 minutes in and Nigeria are still probing for a breakthrough, but France are holding strong for now. The Nigerian forward cut in from the right, delays, and then hits a low rocket through a crowd of defenders which Lloris does well to parry out! Odemwingie is having a fantastic tournament. @Joe, you must be referring to his BPL form. For USA shirt, he is quite important to the system and our offense. Hello and Good Day Tom & the BootRoomers (not bad for new band name)! Been catching spots of the game here and there. Hearing the reffing is pretty lax. and noone converting chances yet... That about right? Hey blytzus! That's right - it's still up for grabs. 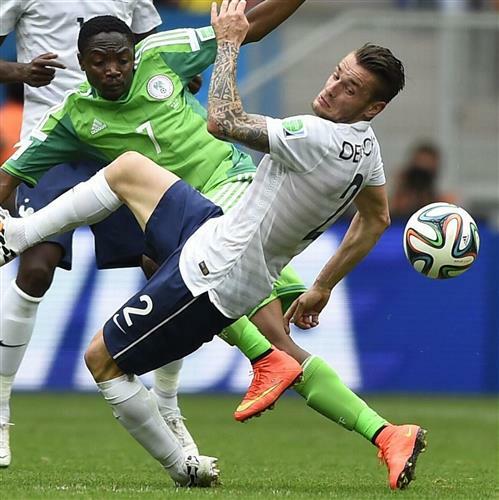 ESPNFC.comThe Round of 16 clash between France and Nigeria remains all square at half-time. Attacking Third Touches this half: Nigeria 32, France 9. Valbuena whips a free kick in from the left and Nigeria comically try to clear; Les Bleus keep the pressure up, but Pogba is blocked out by fine defending after Enyeama loses a cross. I'll stay on for the how long I can. Anyone been starring? Where are Musa or Benzema.. no noise from them yet? This game in a nutshell: great midfield passing, good runs, lousy cross/wasted shot. Repeat. Good defending from Koscielny as he blocks out a low cross from Musa to prevent Emenike having a tap-in at the near post. God Germany will eat the two teams up. OFF THE LINE FROM NIGERIA! France should be 1-0 up here as Karim Benzema plays a wonderful one-two with Griezmann and is clean through, but he wastes a vital chance as Enyeama makes the save, and Moses clears the bobbling ball off the line! Wow! This game has just exploded into life in the 2nd half! How did that not go in?? Benzema can turn the game around in a second. So much for my theory!!! How did Benzema miss that?